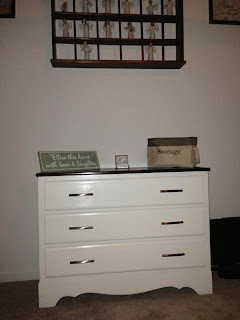 Okay, I've been promising this tutorial on Stephanie's (aka the childless aunt to my two kids) nursery room furniture for some time. 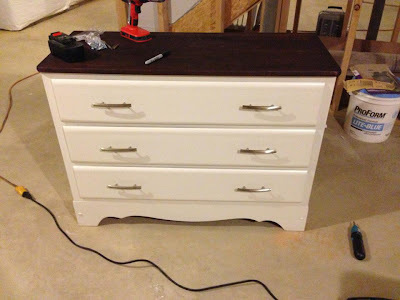 I think we're getting closer to having a kid with this latest DIY - at least I would hope so! Sorry, I have been a little behind - I am also editor over at The Royal Baby Blog and perhaps you heard Kate Middleton gave birth, showed off her kid (while wearing heels 25 hours after giving birth without an epidural to an 8 lbs, 7 oz prince), and revealed his name as George - that all happened last week...whew! But finally I'm back and ready to share all of Steph's tips and tricks on this nursery furniture makeover. 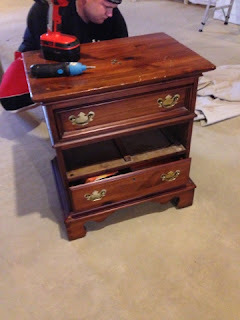 (She did the work, I write the blog because that's just how we roll....she repays me by painting furniture for me. I think I have the better end of this deal.) But anyway....I digress. So here's the deal Steph and her husband had three pieces of furniture - two of the pieces were that were hers when we were growing up and one she got from a friend. 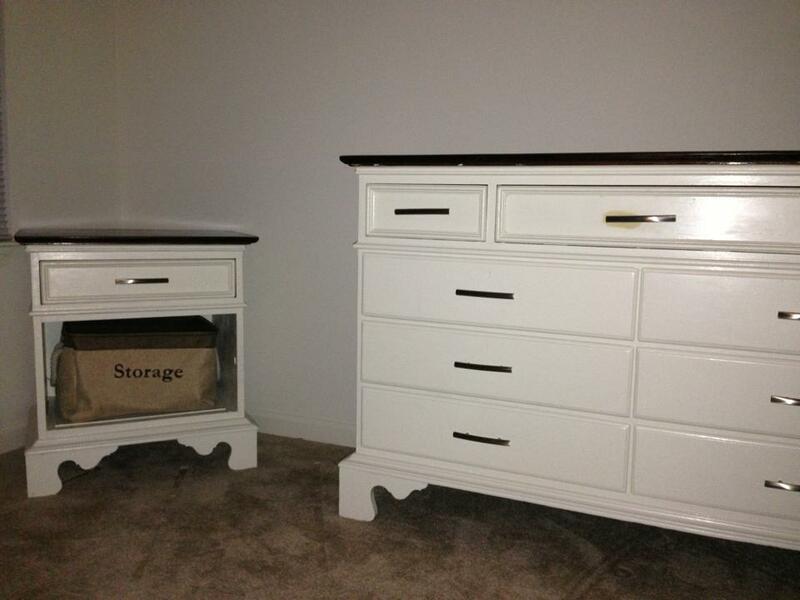 Since the two from our parent's house matched, but the third didn't she needed to refinish them to make them look like they all fit. Not to mention that 28 years of wear and tear and they were in need of a little TLC. The first thing they did was give each piece a good sanding. The drawers and hardware came off and were the entire pieces were sanded down with 150 grate sandpaper. At the last minute, they decided to make the furniture two-tone - and I don't know about you, but I think it was a killer decision. The white furniture with the stained tops looks amazing. They used Behr white enamel glossy paint white paint and stained the tops a dark mahogany. To tie the pieces together, Steph replaced the existing hardware so they'd all have the same handles. She ordered them from 99centknobs.com where each one was just...you guessed it... .99. Similar handles run for nearly $4 a piece at Home Depot. 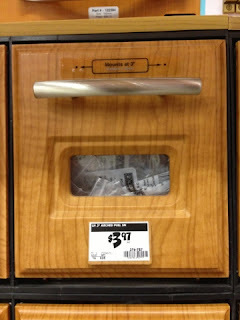 Even with the rather steep flat rate shipping of $11.95 at .99 Cent Knobs, they saved big on the hardware: $28 vs $63.52. Since the new and old hardware were slightly different in size, they had to fill the existing holes with putty and let it dry then paint over it. Then they made new holes to attach the new hardware. 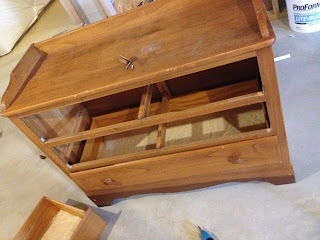 After the holes were drilled for the new hardware, but before the drawer pulls were attached, each piece of furniture was seal with polyurethane to protect it. 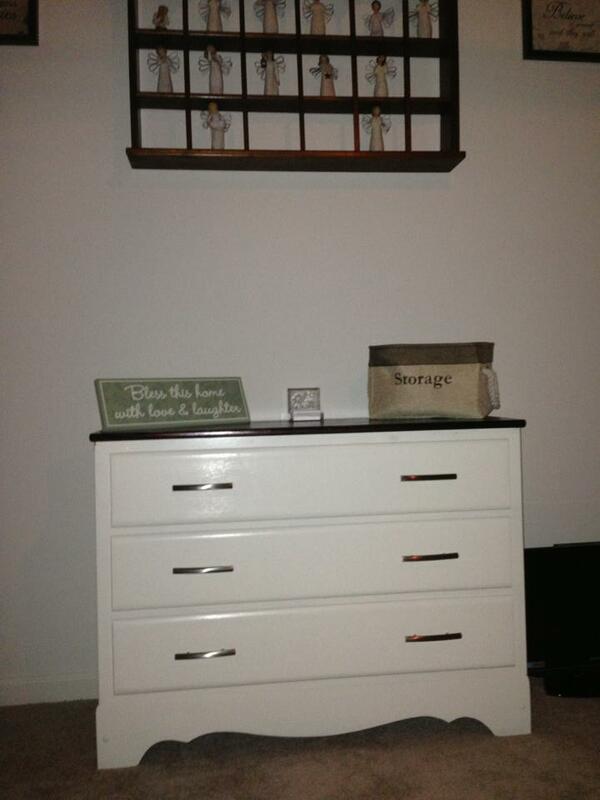 The bottom two drawers were eliminated in the nightstand and instead replaced with a basket. The pair of baskets was purchased at Ross' for $10. The top of this dresser will be used for a changing table. wow what a fantastic post of Bedroom furniture that you have published a brand which is built on quality, style and fine craftsmanship with NZ Solid Pine and Southland Beech timbers all sealed with lifetime guarantee.i hope you will countinue with this stuff. An exceptionally decent inquiry. Luckily most furniture arrives fine and dandy when transported and uncommon is it that issues occur. Anyway there are times when maybe a forklift unintentionally goes through a crate or a thing is inadvertently affected and it's ideal to be set up for what to do when this occurs.